All Santa Barbara Dark Chocolates are vegan friendly and gluten free. This category showcases our vegan chocolates that are also gluten free. Vegan chocolates are made from ingredients that do not contain animal product. Choosing a vegan lifestyle is not about punishing yourself - so why eliminate one of the best treats a person can have? Chocolate. Eating an animal-free diet is a choice you make. Buying organic products might be another choice you make. Picking responsibly sourced, vegan chocolate that is organic is another choice you can make. And you can find it all at affordable costs that won’t break your budget or force you to compromise your values or lifestyle. In a world that increasingly values how food is processed and where it comes from, Santa Barbara Chocolate keeps every step of their process transparent. Our high quality ingredients are Fair Trade Certified and USDA Certified Organic. We’ve spent a lot of time strategically creating alliances with like-minded businesses to bring you products you’ll be proud to incorporate into your life. Remember, not all vegan products are created equally, so make sure you choose a product that aligns with the things you consider the most important. Here’s more information about our vegan chocolate and the company behind it. At Santa Barbara Chocolate, we know our actions have an impact on the rest of the world. So much of what modern businesses do can have a global impact and we believe it’s important to pay attention to that. That’s why we strive to provide products that align with our most important values about the environment, animals, and what we put in our bodies. When we first started searching for quality chocolate products that fit into a healthy and responsible vegan lifestyle - it was impossible to find without paying expensive premium prices. The cheaper options were packed with fillers and not something we wanted to ingest. So digging deeper, we looked for pure cocoa products that were organic. But we also cared about where the products came from, not just how it would affect our bodies. So we investigated further into responsibly sourced cocoa products, and the prices skyrocketed even higher. We didn’t think the choice between values and your wallet had to be so difficult and we sincerely believed there was a better way. 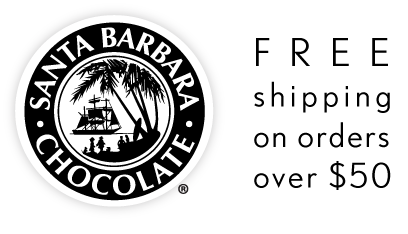 With that in mind, the mission behind Santa Barbara Chocolate was born. We’ve found other businesses that feel the same way and created strategic alliances with them. Our close partnerships with responsible suppliers allow us to bring you luxury chocolates at wholesale prices. Indulge yourself with a much deserved luxury treat without having to question whether you’re leaving a negative footprint on the environment. You can nourish your body with quality ingredients that your taste buds will thank you for and your mind doesn’t have to worry about. Some people may say paying attention to the source of your food is excessive or impossible to trace. But we know better and have made getting peace of mind easy by doing all the hard work for you. That way, you can enjoy your treats guilt-free, knowing you’re supporting Fair Trade and Rain Forest Alliance suppliers. Go ahead and nourish your body with the best ingredients nature has to offer without compromising your other values. Here’s a closer look at the options Santa Barbara Chocolate offers. With so many excellent reasons to choose our chocolates, it would be a mistake to miss out on this opportunity. When you’re ready to find quality vegan dessert ingredients, here’s how you can order with Santa Barbara Chocolate. Finding high-quality chocolate that’s vegan, organic, and affordable is no easy feat. At Santa Barbara Chocolate, we find ways to offer value any way we can without compromising the most important aspects of our products. Our chocolates are competitively priced starting at just $13 per pound for the freshest, quality ingredients that are responsibly sourced and environmentally friendly. Ordering is easy. All you have to do is visit our website, browse from our selection of gourmet vegan chocolates, place your order and checkout through our secure payment system. All our customers can enjoy free shipping on orders over $50, no matter the season or number of products you purchase. If you prefer a smaller order, we offer a promotional flat rate shipping of $9 regardless of actual weight. Most orders are typically processed within 1 to 3 business days and shipped directly to your front door. We’ve been shipping our quality chocolates to customers across the globe for decades, offering exceptional value with guaranteed freshness. Right now you can either choose any vegan chocolate to fit your diet that might be packed with fillers or sourced from endangered areas. Or you can pay exorbitant costs for organic ingredients that are sourced responsibly. Why do any of that when you can have it all in one affordable package? Choose Santa Barbara Chocolate as your vegan, organic dessert ingredient source and support our responsible business practices while treating your taste buds.